Today's oldie might have been my first ever OPI. It's from the 2006 Kick Up Your Heels collection, inspired by The Rockettes. I also have Opening Night Champagne from that bunch. Both were Ulta clearance finds after that xmas, but I can't remember if I bought them at the same time or not. We didn't have many Ulta locations here back then, so I probably did. 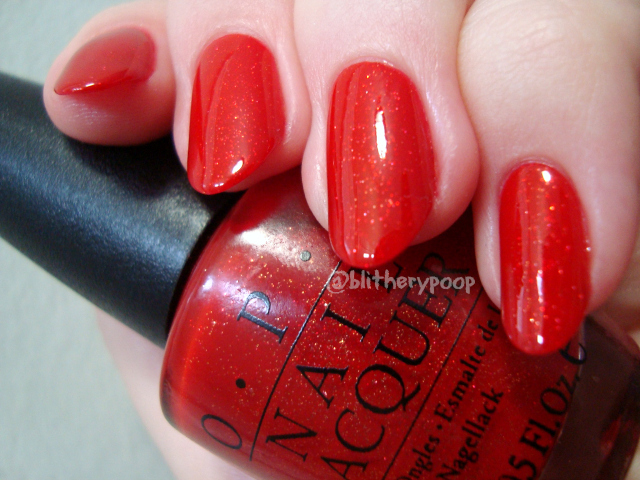 I'd admired OPI from afar for years, but I didn't drive back then and online shopping wasn't as easy, so deals were a rare thing. I still remember how giddy I was to buy my first from my eventual favorite brand. Red Dazzle is a lipstick red jelly with a scattering of gold microglitter. 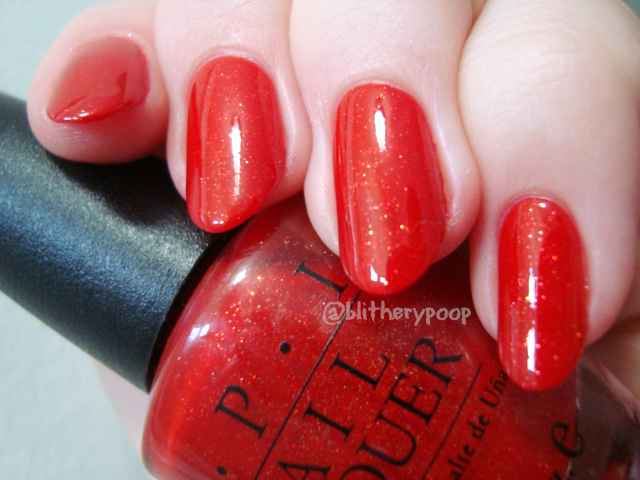 If Red Dazzle looks familiar to you, it's because OPI released a near-dupe a couple of years ago. The Polishaholic posted a comparison where you can see that Red Dazzle and The Spy Who Loved Me aren't exactly the same, just close. Red Dazzle is decidedly warmer and has microglitter instead of microfleck shimmer, and less of it. It's a twinkle, not a glow. I used four coats for maximum depth. While it is pretty and I'm happy to have it, I think the $40 someone is asking for it on eBay is a bit nuts. The price is just high because of age and scarcity. You could layer dupe it well enough with The Spy Who Loved Me and a red jelly. It's just TWO WEEKS until xmas!! I need to get a move on. My tree isn't even up yet. How ready are you?